We’re going to try a couple amazing plugins which many of you probably already know! The Sonnox Oxford Dynamics, Dynamic EQ and Oxford SuprEsser! We got a double (triple?) 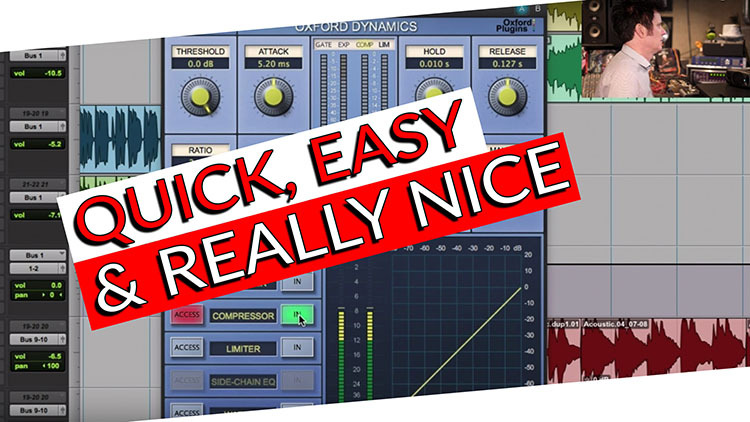 whammy today- You can win these amazing plugins in the giveaway AND you can download the Multitracks AND there is a tutorial on this as well so you can try the plugins on the Multitracks! Those of you who watched the tutorial already will know I did a lot of work on the vocal with different types of De-Essing, so I turned everything off and I pulled up the Oxford SuprEsser. When I did the original mix I used different De-Essers at different points. The Oxford SuprEsser is a really sweet idea, it’s impressive cause it’s able to grab a whole area. The Sonnox Dynamics has so much to offer (Gate, Expander, Compressor, Limiter, Side-Chain EQ, and Warmth control) I could do a 20-minute tutorial just on it. I like this, it’s really really nice! I’m just playing around having a lot of fun with the Dynamic EQ- it’s like shaping EQ without it getting aggressive! Being a Dynamic EQ, it’s grabbing it and EQing it when it gets excessive. That’s what’s different from me just pulling down some EQ- it’s a really nice tool for evening out the vocal. I’m new to this and I know many of you watching have been playing with this for year! People have been telling me about Sonnox for a while and that’s why I wanted to find out all about it. The SuprEsser has really controlled the high end on the vocal and made it really close to the sound that I want. I think in modern pop and rock what we are always trying to do is get the vocal to be bright and present without it ever being aggressive. One of the realities about working in digital only is that we are so used to analog equipment smoothing out transients and all that stuff! – We’re always looking for tools that control that high end. These tools really helped me get a really really smooth pop vocal. When I’m using De-Essing, I typically have to back it off because I fall in love with the sound of it and then I realize I’m taking so much of the high end out of the vocal that it can end up making the vocalist sound like they’re lisping! The SuprEsser’s doing fantastic work on the vocal. Typically on bass guitar, I’ll use a bass boost and sometimes I’ll control it with multiband compressors. What’s interesting about this song is the verses are played with fingers and the chorus is played with a pick, so it’s a totally different performance. We have no lack of low end on the picks, but on the fingers, there’s a whole lot. With the Dynamic EQ we can go where it goes a little nutty and we can narrow the EQ to even it out! Then if we want to boost it later on, we can. One of the problems with just having an un-dynamic EQ, as much as we love them, is we’re boosting areas that sometimes we’re getting a note that is just out of control. Bass Guitars are really problematic for that, I might be compressing 90% of the signal but when that note comes in it might hit the compression with the same amount and it would totally change the characteristics of the sound. So a Dynamic EQ is only going to target those specific areas as they boost. On the guitars, I boosted areas that weren’t getting enough and cut others between the two notes and it was so quick and easy and really really nice! In an instance like this it might be the only EQ device I need on the guitars, it’s working really well! It just evened out all of the guitar parts and it only took a few seconds and I got a great guitar sounds. I hope you enjoyed this review & demo! I’m so glad I had the opportunity to finally try all of these plugins! Simple and intuitive control of problem frequencies using a precision frequency-conscious compressor. It operates between 20Hz & 20KHz so can be used for much more than simple de-essing. A specific frequency-band triggers the process when it passes your chosen threshold level. The result is a gentler, more natural alternative to using a fixed EQ. The combination of 3 listen modes and a clear FFT display allows you to both hear and see where problem frequencies are – before dialling them out with a single control. There’s a simple mode for quick fixes with an advanced mode for increased functionality and fine-tuning.